Support us by donating to our Crowdfunding Page! Did you know that the work we do is funded solely by donations? In order to continue and expand the work we do we are today launching our Crowdfunding page. Please donate even if it is only a small amount (£1 from everyone would soon add up!) also please share our page in the hope others will donate and share! 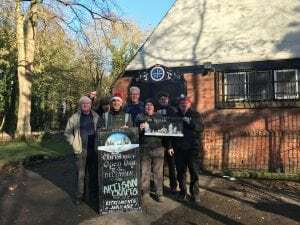 Croxteth Park Volunteer Group's website is hosted by, but not compiled by TCV. The information contained on this website is for general information purposes only, supplied by Croxteth Park Volunteer Group. The views provided by Croxteth Park Volunteer Group are not representative of TCV. TCV is not liable for any loss or damage including, indirect or significant loss or damage, or any loss or damage whatsoever arising from loss of data or in connection with, the use of Croxteth Park Volunteer Group's website. We do not endorse, control or approve the content on Croxteth Park Volunteer Group's website.